Tarazed's Many Hobbies: Crochet eats yarn. I've been thinking about projects to use up some of this mountain of yarn I have, and also contemplating the large amount of cotton and cotton blend yarn a friend gave me a couple of years ago. Among the cotton was 20 balls of Patons Grace in a nice medium green called Fern, which is a color now discontinued, but Wasabi is very similar. Asking around on the #ravelry channel, I got a suggestion of the Sunny Spread. I haven't done crochet in a while, and that looked like a good use of the yarn. 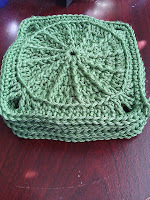 Once I got started, I realized that duh, crochet uses about 3 times as much yarn as knitting for the same space. This is good. I can get 5 squares out of one 50g ball of yarn, plus a bit extra which will be used for seaming. I'm currently planning on either a 9 x 11 blanket, or a 10 x 10, depending on if I need the extra yarn from the 100th square for seaming. 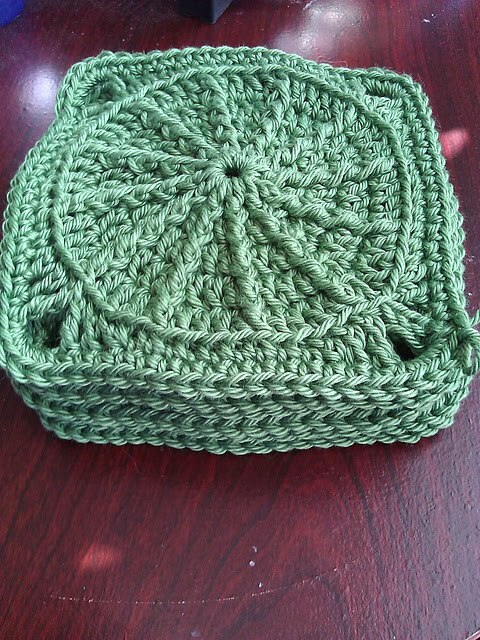 I am planning on buying a couple balls of another color for the outer border, however, as I think it'd set off the green better. I have made an exception in my diet that I can get yarn to finish a project that uses stash, as long as there's more stash than new yarn. I'll try not to abuse that too often, though. I already got 400g of Knit Picks yarn for my argyle socks, which I'll talk about in a later post. FO and yarn totals so far.